Scotland always sounds like a great place to be in the winter. Roaring log fires, gorgeous scenery and hopefully some snow just to set the whole event off. You could opt to stay in a hotel in one of the major cities, use that as your base and go out and about from there. Depending on what time of year you go, you could stay over Christmas and/or catch the traditional Hogmanay celebrations which are always well attended. If you’re looking for a modern hotel that’s going to be perfect for getting around cosmopolitan Edinburgh, there are plenty to choose from. For a romantic Scottish winter break, some of the hotels are absolutely breathtaking, perfect for a snugly holiday for two in the cold. Why not stay a luxury castle or an elegant country house just perfect for secluded peace and quiet. If wild and wintry is what you’re looking for, you probably want to head off into the Highlands, although bear in mind that if the weather does turn inclement during your winter break, transport could become an issue. There are plenty of tour operators with Highland lodges and cottages to choose from, these are usually self catering and you trade the scenic views and tranquillity of the Highlands for the lack of amenities. You’ll certainly need to arrive prepared for a self catering Highland winter break, although you’ll find that lodges or cottages are generally well stocked with everything you need, remember to pack some toilet rolls and the food for the next morning at the very least! Some of the larger complexes provide more than one lodge and also shopping facilities, so if it’s important that you can get your supplies on foot, opt for this instead of a secluded cottage. Hogmanay is the big event of the Winter, although Burns Night is also celebrated soon after. 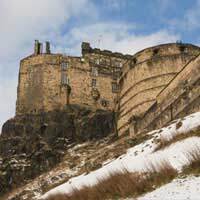 Many tour operators offer winter breaks just for Hogmanay, designed to cater for the visitor who simply wants to soak up a bit of Scottish hospitality and have a bit of a party. Edinburgh is famous for its lavish firework displays and Hogmanay cheer, so would probably be one of the best places to head towards if you want to experience the full Hogmanay tradition. They don’t call it ‘The world’s best New Year Celebration’ for nothing. The Hogmanay celebrations in Edinburgh last for days – and encompass street performers, street parties, music, dance, processions and general good festive cheer. Burns Night (25 January) is another famous Scottish winter celebration, and a must if you want to experience the true wonder of ‘neaps and tatties’. The typical Burns Night itinerary revolves around food and a drink or two, and the enduring words of poet Robert Burns, who of course is responsible for writing the song that ushers in most people’s new year – Auld Lang Syne. Meals will usually consist of the Scottish delicacy – haggis – with neaps (turnips) and tatties (potatoes) a filling, warming meal that sums up Scotland’s need to fill up with stodgy food in the winter cold! There is usually singing, dancing and poetry reading – plenty of toasting various people, and a good time is usually had by all.